Let’s crunch the numbers. Does smart growth make economic sense? Wednesday, May 1 at 6 PM. Free and open to the public. U of I Legacy Pointe Conference Room, Idaho Water Center, 322 E. Front Street, Boise. Free off-street parking is available in the Idaho Water Center and Ada County Courthouse garages. More information and links maps can be found here. 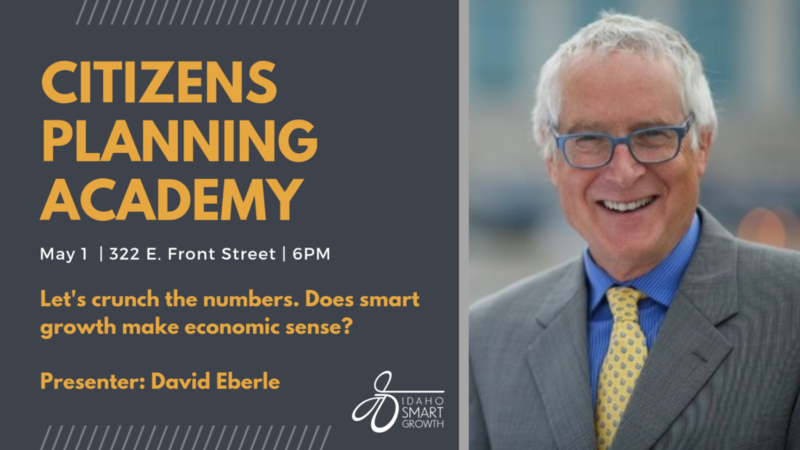 Dr. David Eberle, a native of Boise, Idaho, has made a career in public policy and financial analysis for communities, agencies, and companies. Dr. Eberle began his professional career in the Treasure Valley in 1978 as a staff economist with Idaho Power. In 1983 Dr. Eberle left Idaho Power Company to reinstate The College of Idaho economics department. 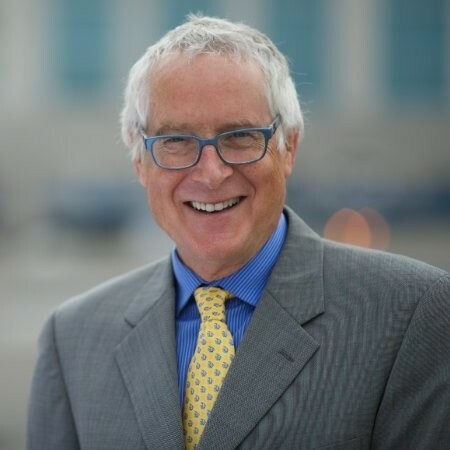 Over the next ten years Dr. Eberle taught full time at Boise State University and was vice president and board member of a real estate development and hotel management company. In December of 1995, Dr. Eberle completed his Ph.D. in economics from the University of Nebraska and shortly after began his consulting firm. The firm provided economic services to cities, land developers and companies. In 2010, Dr. Eberle left economic consulting to run the Environmental Finance Center for Boise State University. The EFC worked with small communities on their managerial and finance capacity. Dr. Eberle’s work has taken him before the Idaho State Legislature, court-rooms and regulatory agencies as an expert representing his clients. The C.P.A. is a collaboration of Idaho Smart Growth and the University of Idaho’s College of Law in Boise and Bioregional Planning Program. Monthly sessions are designed to help citizens become effective advocates on a wide range of planning topics. Learn more about the Citizens Planning Academy here. RSVP office@idahosmartgrowth.org. Learn more about the series here or view past session videos on our YouTube channel. Idaho Department of Lands, University of Idaho and Idaho Smart Growth have teamed up to provide six Idaho communities with one-day workshops to review and assess their level of wildfire preparedness and set next step actions in place for further planning. This project is funded in part by the Idaho Department of Lands in cooperation with the USDA Forest Service. Learn more about this program here. Communities will be required to support their workshop by providing a location and ensuring participation from the following stakeholders – elected officials, community planners, fire, police, land management agencies (local, state, federal), emergency management (county and city), business owners, chamber members, economic development, soil and water conservation districts, RC&Ds, land trusts, land owners (forest, farm, ranch) and interested citizens. Communities who can commit to these requirements will be selected based on our goals to hold these in different parts of the state to allow more individuals to attend and observe and to look at diverse geographies and also hope to conduct two that are rural, two that are more suburban and two that are more urban. Each community workshop will be set up as a “fishbowl.” This means that while the focus will be on a specific community, members of other communities may attend to observe and learn what they can to take back to their community. Were all stakeholders involved with developing their county’s community wildfire protection plan? If you have multiple wildfire planning efforts are these connected? Are all agencies collaborating on wildfire planning? Have opportunities for improvements been identified if a fire does come to their community? Prioritize strategies to improve prevention and recovery such as education, building codes, land use decisions, mitigation, revegetation, etc. If selected, we will work with your community to identify the specific scope for your planning workshop. In preparation we will review any plans that might and/or should comment on wildfire in the WUI such as comprehensive plans, hazardous mitigation plans, emergency management plans, your county’s Community Wildfire Protection Plan (CWPP) and other relevant plans your community has in order to understand what plans are in place, help you assess how coordinated these plans are and identify where there are gaps and /or contradictions. We will also conduct interviews with key stakeholders as identified by your community in preparation for this planning day. 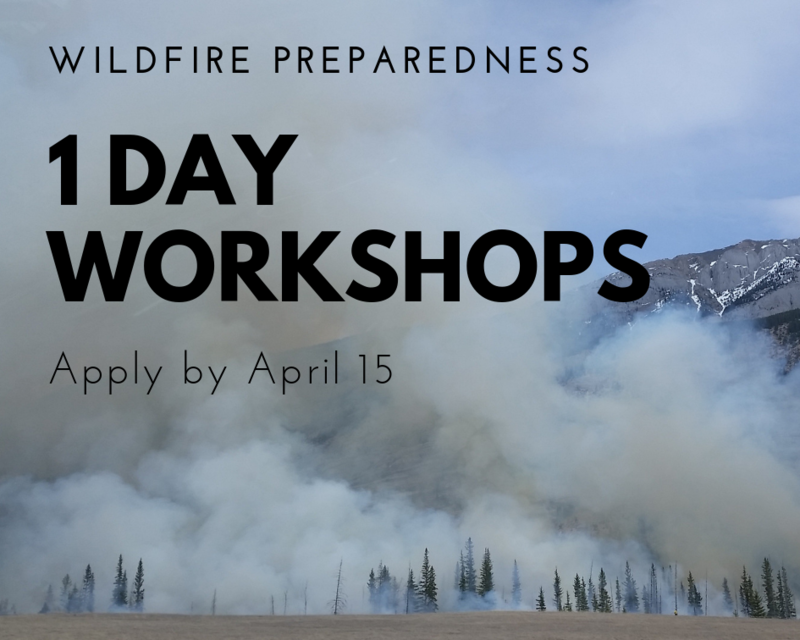 If you’re interested in this one-day workshop to assess how prepared your community is for wildfire on the edge of development and determine what additional planning you want to do to improve their wildfire preparedness and resiliency fill out this form and send to Deanna@idahosmartgrowth.org by April 15th.